Once a week, members of the Homeless Football Team hit the streets, search Shamshuipo’s labyrinthian underpasses and overhead bridges, and venture into dank alleys to deliver a bit of cheer, much-needed information and toothpaste to other homeless people. Wai Tung, the social worker in charge of the team, has a wonderful way of rallying his troops – sometimes cajoling, sometimes half-bullying them into helping their less-fortunate friends. 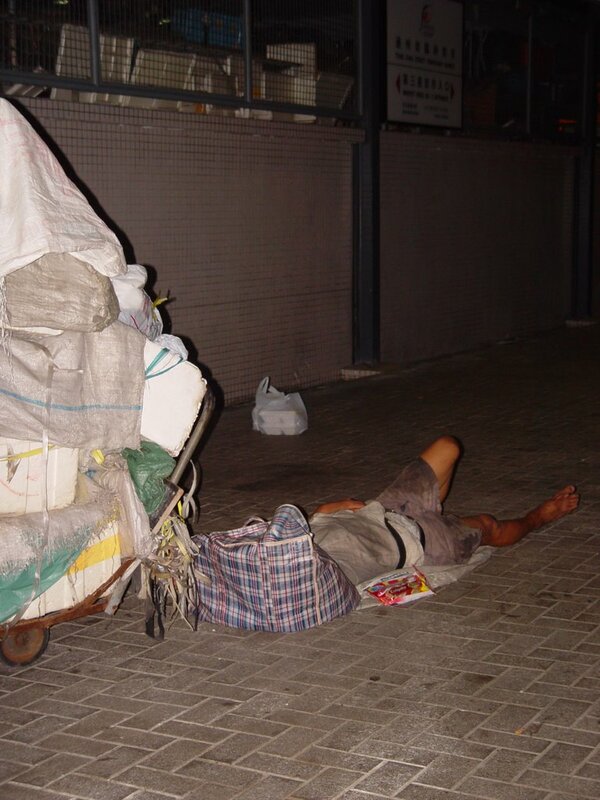 Yes, even among Hong Kong’s poor, there is a social divide. Some street sleepers, are simply not as equal as others. They are the ones who’ve been homeless for years – too old, too infirm, too poor or too comfortable to find proper shelter. Like the Man With The Pets On The Bridge. In land-scarce Hong Kong, this gentleman’s staked out a pretty substantial chunk of space for himself and his animals. 300 square feet, at least. And although his piles of used furniture, old clothes, broken umbrellas and buckets are a gasp-inducing sight, what really hits you as you first approach, is the stench of cat piss. The man is a collector of things… and animals. 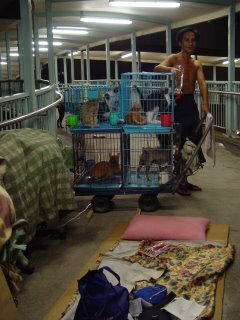 When we visited, a terrier pleaded to be released from his tiny cage, six cats hissed at us and a big, black dog offloaded a lump of poo near our shoes. Animal rights activists won’t approve, but the man says he loves his pets. Won’t give them up, not even if he can’t feed himself. Then, there are the Men Under The Bridge. They’ve been there for years and seem to live in relative comfort – beds, wardrobes a kitchen and two well-fed dogs to guard the place. These three have a neat little set-up. A trifle too close to the main road for real peace and quiet. But a heck of a lot better than some of the tiny apartments we’ve visited. The three say they’re not looking for a new place to stay. Under The Bridge is home. Some nights yield sad new discoveries – an eighty-year old, too sick to move; intoxicated young men in Maple Street; a woman searching through garbage heaps. Team members typically visit with an info sheet and a small packet of daily necessities. No one’s trying to save the world. That would be too daunting a task. Sometimes they’re told to just go away. But most days, the team’s efforts are appreciated. They’re there to listen, offer advice on where to get a free meal, take a shower, or find a job. And for soccer fans, there’s always an open invitation to come and play ball.